When you think about fondue, you may be reminded of the 1970s—the cheesy concoction was the life of the party throughout the decade. 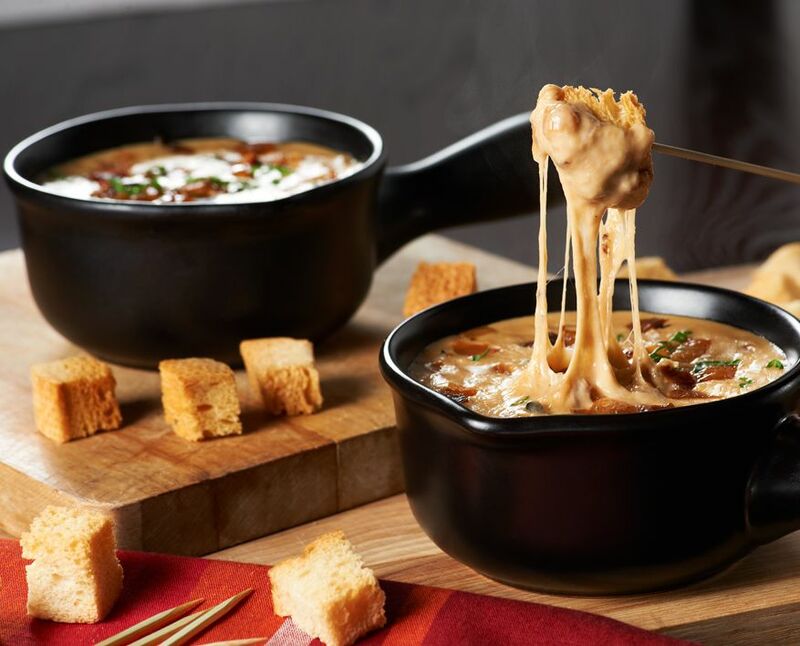 We’ve updated this vintage treat and made it more of a party pleaser with a creamy French onion soup twist. Grab a fondue fork (or just a spoon!) and share this interactive treat with friends and family. They’ll be clamoring to dunk bread, veggies, and more into this savory recipe. While fondue might’ve had its heyday in America during 1970s cocktail parties, this dish has international appeal. French onion soup has an equally illustrious past—it was created in the court of King Louis XV. Who would’ve guessed that these two globetrotters would be joined by the common bond of cheese? Pour the oil into a medium-size sauté pan set to medium heat. Sauté the onions, tossing frequently, until brown and caramelized, about 15–20 minutes. Toss the cheeses with the flour in a medium mixing bowl until evenly coated. Combine the beef broth, cooking sherry, and concentrated beef broth in a medium sauce pot over medium-low heat and bring to a slight simmer. ​Cook’s Note: Don’t have cooking sherry on hand? Suitable substitutes include dry red or white wine or apple cider vinegar. Whisk the cheese into the mixture in four batches, waiting between each addition for the cheese to melt. Don't let the mixture come to a boil. When the final batch has melted completely, remove the pot from the heat and stir in the caramelized onions. Transfer the mixture to a fondue pot and sprinkle the nutmeg on top. Serve with the French bread, asparagus spears, potatoes, broccoli, or cauliflower, if desired.